Today's Lenten Reflection comes from Father Rocky's series, "40 Lenten Lessons on the Mass". Today's Lesson is about the 'Memento' in the Eucharistic Prayer. After directing our prayers of offering to God the Father through Jesus Christ, the priest prays for the Church, the Pope, the local bishop and all "who holding to the truth, hand on the catholic and apostolic faith." And then the priest says "Memento" which is Latin for "Remember". "Remember, Lord, your servants, N. and N."
At this point the priest and all the people pause to pray in silence for a few moments. What do they pray for? Actually, the question is "who" do they pray for? 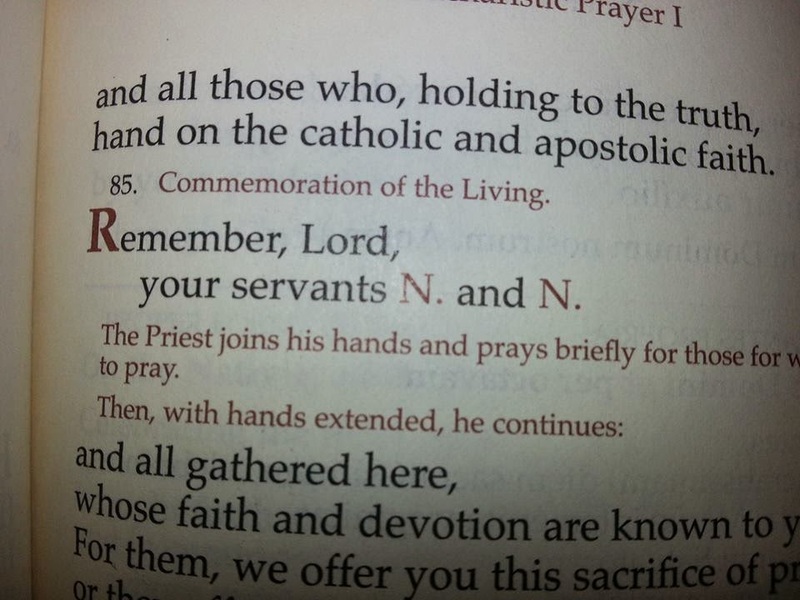 They pray for "N. and N.", with the "N" signifying the first letter of the latin word "nomen" which means "name." The moment has arrived to pray for people and for their needs, because the Mass is first of all an opportunity for prayer of petition. Who do you pray for? The priest is obligated on Sundays to pray for his parishioners, but for most priests -- as times goes on -- their list grows more and more. One of my favorite authors, a priest himself, Fr. Leo Trese offered this reflection on the Memento in his book "Vessels of Clay." "I just can't bring forward enough intentions . . for the time is so short. . . All I can say is 'For all the intentions, Lord, which I mentioned to You in my morning prayers.' It is a long list, whose established pattern undergoes daily additions and modifications. "For all the intentions of Thy Sacred Heart, through the hands of my Mother Mary' -- so begins my litany, as I toss into those hands every need I can recall: for my parents and family . . .the people of my parish, especially the lax and fallen-away (particularly right now for old Joe Marron who resists so stubbornly and for Clem Synder who married last week in the Lutheran church) . . . for my non-Catholic parishioners too, especially the ones I'm instructing and have instructed . . . for the children of the parish, especially those in public schools . . .for the grace of vocations from this parish, especially for Tommy and ones who are 'thinking' -- and for the perseverance of those who already have answered Thy call . . .
"For myself, dear Lord, in thanksgiving for the countless graces I have received, in reparation for the sins I have committed, for the grace of final perseverance . . .for Faith, Love, Purity, for zeal in Thy service . . . that I may do Thy will, whether I know that I am doing it or not, whether I want do do it or not: MAKE me do Thy will . . .
"For my relatives, friends, and benefactors: for all whom I ought to pray or have wished to pray; especially for all those to whom I have eve ministered, or for whom I am in any degree responsible -- grant that no soul may be lost or may suffer through any fault of mine. (It is here that memory dredges up the discomforting recollections that only the infinite bounty of the Mass can offset: young Eddie, whom I expelled from school when more patience might have saved the pieces; the fallen-away Morellis, who might have been converted by more Christlike kindness when they sought Christian burial for grandpa, and were dismissed so abruptly. When I mediate on Judgment, it isn't my personal sins that make me sweat -- Mercy will cover those -- it's my pastoral derelictions that make me squirm: I've Justice to deal with there) . . .
"For the Pope, for my Ordinary, for the bishop who ordained me and the pastors who guided me and the Sisters who helped for me; for all the priests and religious, especially of my own diocese and particularly for the errant -- very especially for N. and N. (dear Lord, by what grace am I here and they are gone? ); for missionaries, home and foreign -- comfort them in their discouragements, fructify their labours by Thy grace . . .
"Yes, it is a long list, and full of detours, images evoked and evil done and good left undone, of individuals in need and souls in distress, of responsibilities shirked and graces wasted. It is well that ten minutes of my morning prayer time has been reserved for the making of my daily intentions . . .It is well too that the Mass IS an inexhaustible torrent of graces; there is so much to pray for, so much..."